I’ve had my eye on Zoeva brushes ever since I first discovered them. My first lusting was the original Rose Gold collection sets with the brown handles – I’m a sucker for anything rose gold. Then I heard they were recently releasing the Rose Gold Vol.2 sets, so I saved up my pennies for the release date, and then I stocked up! 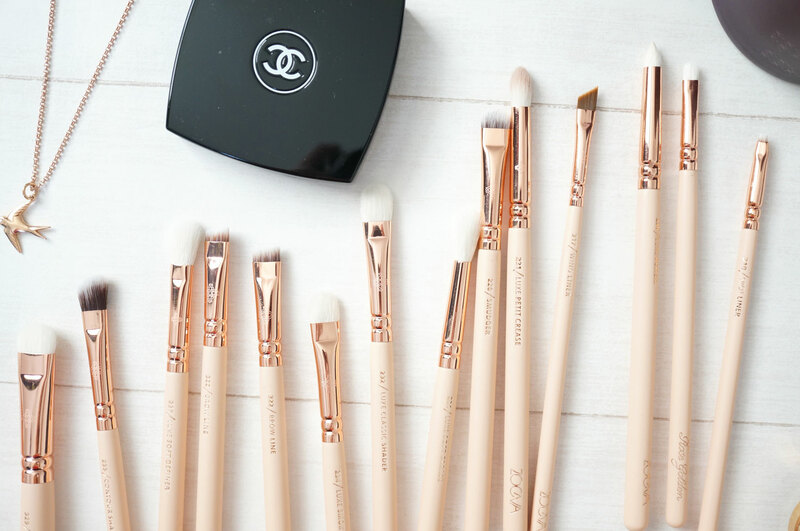 The brush sets were EUR 70 each including the brush holders, which works out at just over £50 each, compared to the same sets which are £61.50 each from Love Makeup in the UK. Shipping on the German site was EUR 7.50 (£5.43) so it definitely worked out to be the cheaper option purchasing from there. This may sound expensive, but with one set including eight brushes, and the other including twelve, they’re actually really good value for money, averaging out at just over a fiver each. The brushes are most definitely amazing – as expected. Apart from being beautiful to look at, they really are top quality too, the bristles are soft but firm, and they’re synthetic too in case you were wondering. I now have literally every eye brush a girl could ever want or need! The face brushes were slightly more limited so I also purchased a fan brush separately which I had my eye on. The sets also come in beautiful rose gold metallic leather cases, with shiny rose gold zips. The cases are fantastic quality too, so I’m now wondering what I can use them for! I’ll briefly touch on the Rose Gold Eyeshadow Palette, which at EUR 17.50 (£12.66) for ten good sized shadows is a complete bargain. I’ll being reviewing this separately though so you can get a good look at it. They really are beautiful to look at and an amazing price!